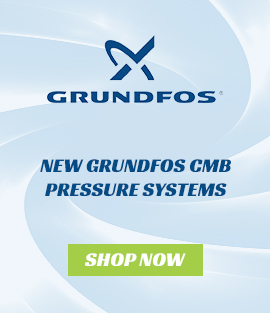 A long awaited breakthrough, the Grundfos CMBE Booster range of fully automatic variable speed drive (true constant pressure) pumps suitable for use on domestic pump systems, schools, commercial applications and nearly anywhere that varying duties are encountered. The CMBE Booster is supplied with the pressure set at 300 kPa but this can be easily adjusted on site by simply pushing a couple of buttons. Suitable for suction lifts to 1m when fitted with a good quality foot valve. 1" female BSP inlet and outlet, 2L pressure tank, Grundfos pressure transducer and Grundfos integrated speed controller makes this just the best "true constant pressure" VFD pump on the market. We can supply this pump with the bonus fittings and polyslab pump cover as shown on the images for an additional charge. Click here to download the pdf spec sheets. The CMBE3-62 will provide a constant 350 kPa for flows from 1 - 85 litres per minute, or, a constant 450 kPa for flows between 0 and 70 L/min.